Sun’s Island Suites are situated in the very quiet and picturesque neighborhood of Neochori in the heart of Rhodes town only 400m from the center of Mandraki and 200 meters from Rhodes Casino. The property is easily accessible by car, located 14 km from Diagoras International Airport of Rhodes and only 3 km from the Port. The nearest sandy-pebbled is at 300 meters while the popular organized Elli Beach and the Aquarium are also within walking distance from the Suites. 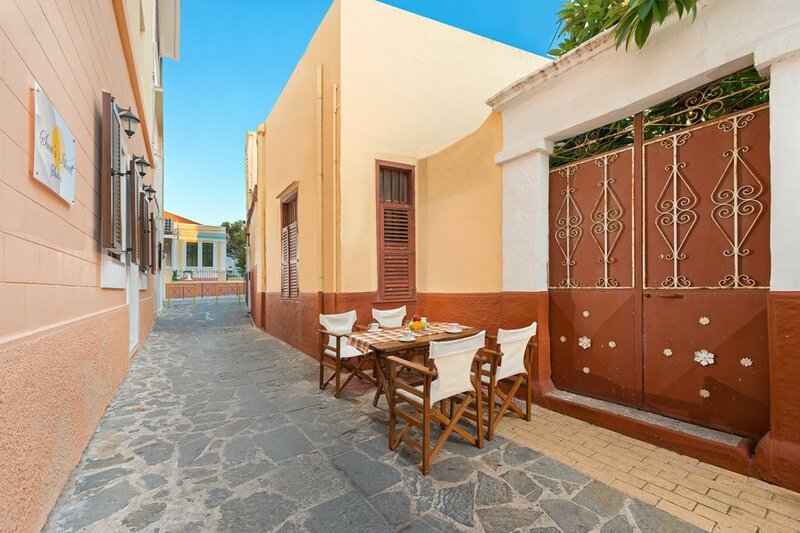 Within walking distance from the property you will also find organized supermarkets and grocery stores for your daily necessities as well as bars, clubs and restaurants and the Medieval Town of Rhodes at 800 meters. Free public parking is available on site. While giving an intense attention to detail through decorating ideas and innovative inspirations, the design intention was to seamlessly blend the structure of the Suites into the texture of the existing traditional picturesque paths and neoclassic buildings of the neighborhood. In an effort to retain the image of the old houses, wooden beams have been used for the living room’s ceiling.